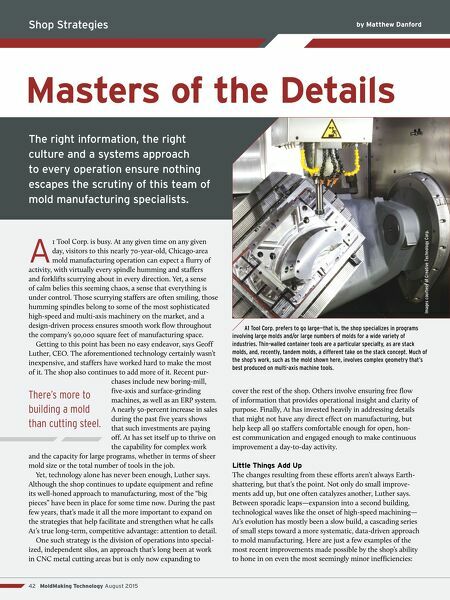 Shop Strategies 42 MoldMaking Technology August 2015 by Matthew Danford Masters of the Details cover the rest of the shop. Others involve ensuring free flow of information that provides operational insight and clarity of purpose. Finally, A1 has invested heavily in addressing details that might not have any direct effect on manufacturing, but help keep all 90 staffers comfortable enough for open, hon- est communication and engaged enough to make continuous improvement a day-to-day activity. Little Things Add Up The changes resulting from these efforts aren't always Earth- shattering, but that's the point. Not only do small improve- ments add up, but one often catalyzes another, Luther says. Between sporadic leaps—expansion into a second building, technological waves like the onset of high-speed machining— A1's evolution has mostly been a slow build, a cascading series of small steps toward a more systematic, data-driven approach to mold manufacturing. Here are just a few examples of the most recent improvements made possible by the shop's ability to hone in on even the most seemingly minor inefficiencies: A 1 Tool Corp. is busy. At any given time on any given day, visitors to this nearly 70-year-old, Chicago-area mold manufacturing operation can expect a flurry of activity, with virtually every spindle humming and staffers and forklifts scurrying about in every direction. Yet, a sense of calm belies this seeming chaos, a sense that everything is under control. Those scurrying staffers are often smiling, those humming spindles belong to some of the most sophisticated high-speed and multi-axis machinery on the market, and a design-driven process ensures smooth work flow throughout the company's 90,000 square feet of manufacturing space. Getting to this point has been no easy endeavor, says Geoff Luther, CEO. The aforementioned technology certainly wasn't inexpensive, and staffers have worked hard to make the most of it. The shop also continues to add more of it. 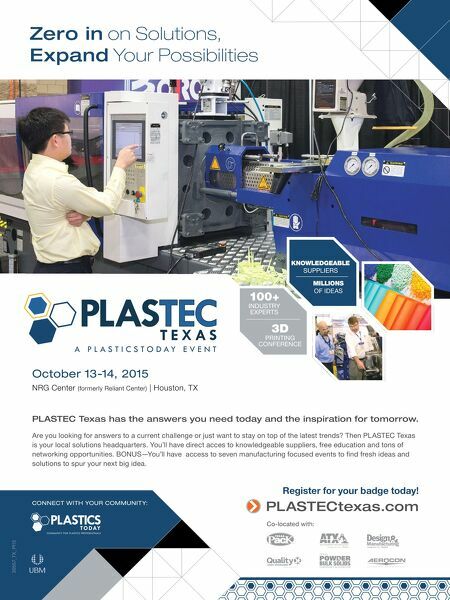 Recent pur- chases include new boring-mill, five-axis and surface-grinding machines, as well as an ERP system. A nearly 50-percent increase in sales during the past five years shows that such investments are paying off. A1 has set itself up to thrive on the capability for complex work and the capacity for large programs, whether in terms of sheer mold size or the total number of tools in the job. Yet, technology alone has never been enough, Luther says. Although the shop continues to update equipment and refine its well-honed approach to manufacturing, most of the "big pieces" have been in place for some time now. During the past few years, that's made it all the more important to expand on the strategies that help facilitate and strengthen what he calls A1's true long-term, competitive advantage: attention to detail. One such strategy is the division of operations into special- ized, independent silos, an approach that's long been at work in CNC metal cutting areas but is only now expanding to The right information, the right culture and a systems approach to every operation ensure nothing escapes the scrutiny of this team of mold manufacturing specialists. A1 Tool Corp. prefers to go large—that is, the shop specializes in programs involving large molds and/or large numbers of molds for a wide variety of industries. Thin-walled container tools are a particular specialty, as are stack molds, and, recently, tandem molds, a different take on the stack concept. Much of the shop's work, such as the mold shown here, involves complex geometry that's best produced on multi-axis machine tools. There's more to building a mold than cutting steel. Images courtesy of Creative Technology Corp.